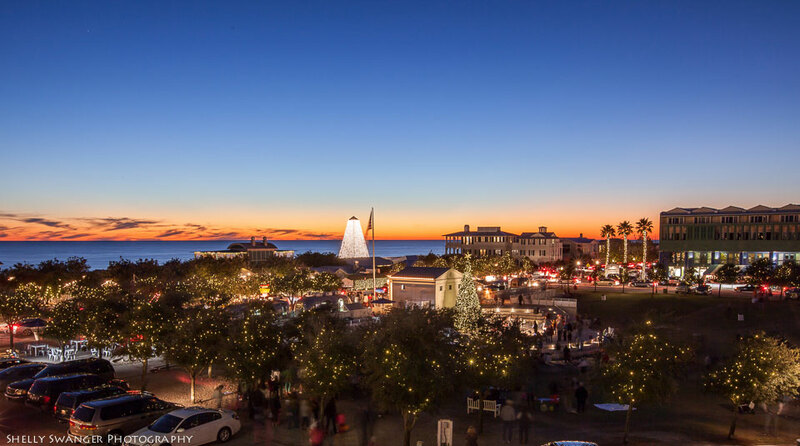 Combine the small-town atmosphere of a beach community parade, throw in a dash of Santa Claus, and mix with the official lighting of Seaside, FL–the remarkable town on Florida’s Emerald Coast–and you have the perfect makings to kick off the holiday season at the beach. Each year, Santa and Mrs. Claus arrive in Seaside during the annual South Walton Holiday Parade. They have arrived on fire trucks, convertibles, and even horse-drawn carriages. It all begins this year on Saturday, November 26, 2016. The parade begins at 4 p.m. in front of the Seagrove Plaza and proceeds west past the rows of spectators to the town of Seaside. At 5 p.m., the celebration really begins in the amphitheater with holiday festivities, carolers, music and, of course, photos with the Claus couple. Soon, the master of ceremonies asks all the kids to the stage to sing to the crowd of smiling faces, and after jingle bells, the countdown begins in unison to “Turn on the Town.” Seaside, Florida all in lights is a sight to behold and a memory of a lifetime.